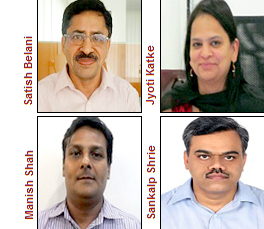 MRSS India has appointed Satish Belani as Measurement Science Advisor; Jyoti Katke as Director, Client Servicing (Western Region); Manish Shah as Operations Head, India; and Sankalp Shrie as Project Director - B2B. The firm was set up in 2012 by full service agency Majestic MRSS in partnership with former Nielsen MD Sarang Panchal, to offer Indian marketers local access to technology for consumer insight generation. The firm previously shared an office with Majestic MRSS, but re-located its fifteen members of staff to a new two-floor, 3,000 square foot space in April. Belani joins with more than 25 years' analytics experience. He worked as Head of Advanced Analytics at Datamatics Global Services; and spent more than fifteen years at Nielsen, where he was Director of Operations for South Asia, in charge of data analysis, delivery, training, recruitment, advanced statistics, and measurement science. Katke has more than thirteen years' strategic experience, having previously served as Branch Head at Market Probe, and Senior Manager of Client Solutions at Nielsen. Shah is a B2B researcher, who joins with more than fourteen years' experience from work at TNS India. Shrie was most recently Group Project Director at TNS, while previous roles included Senior Manager at IDC, Industrial Analyst at Frost & Sullivan, and Senior Client Service Executive at Nielsen. He has more than thirteen years' MR and consulting experience. Web sites: www.mrssindia.com and www.mmrss.com .